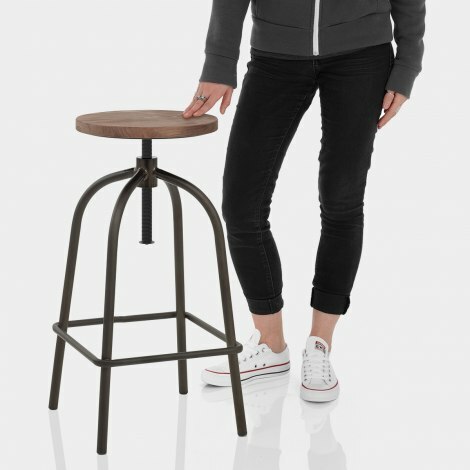 Brace yourself for the fantastic factory-style of the Vice Industrial Stool, a solid piece of furniture with an antiquated feel. If you are looking for the much-loved industrial look, the Vice is an ideal choice to bring that aged character to your home. 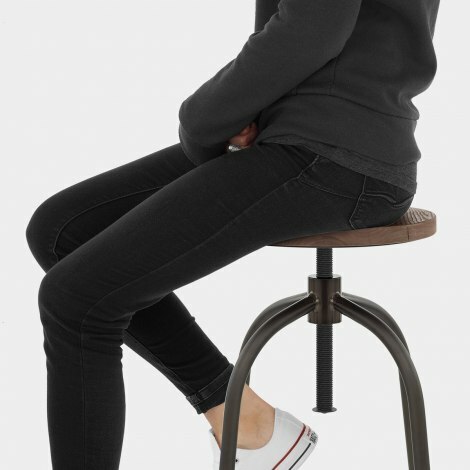 Fixed on a screw mechanism for variable height, the backless circular seat is fashioned from solid dark wood that brings a natural rustic texture, and it can also swivel 360-degrees. Four metal legs make up a substantial frame and have an antiqued finish that offers vintage chic. Bracing bars provide integral footrests, strengthening the frame and ensuring your feet have support at every angle. Protective pads finish the Vice and bring functionality to this distinctive design. Very happy with these bar stools. Excellent fast service from the company . Excellent quality and perfect for my kitchen thank you.